cPanel is used for hosting account management as it is part of the Shared Hosting and Managed VPS services offered by SuperHosting.BG. 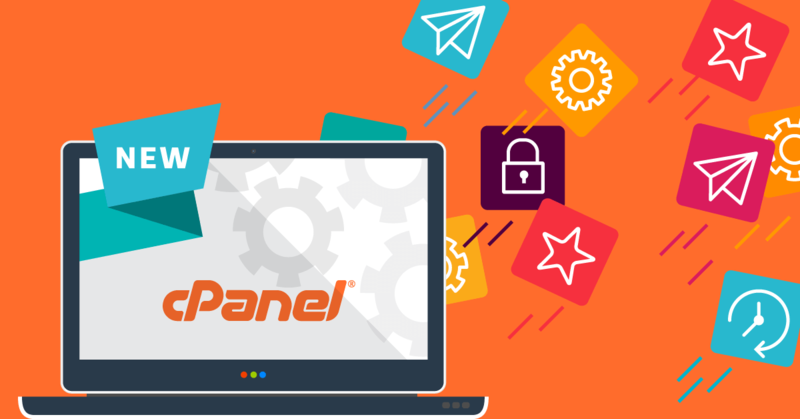 cPanel is one of the easiest to use and widespread web panels enabling you to use many tools and settings for easy management of your hosting account. Some of the most popular tools allow you to: create email accounts, databases and FTP users; upload and edit files; track data for CPU resources used and others. With each new version of cPanel those tools get further improved. There are also new features, bugfixes and enhancements added to the cPanel's layout and performance. Each new version is adopted by us after numerous tests, so we can be sure everything works properly and the next version is about to come out soon. Except for the standard cPanel tools all hosting services also include super-tools, custom-developed by SuperHosting.BG as they are located in the cPanel sections: SuperHosting Speed-Up and SuperHosting Tools. Improvements and enhancements in the newest cPanel version which are already available for all hosting and Managed VPS servers include tools that will save you time and increase your control over the account. In cPanel version 70 developers fully updated the cPanel's Email Accounts interface. The interface now has a tabbed layout to separate main topics into their respective groups. Adding a new email account is now separated into the Add Email Account tab and the list of available email accounts is separated into the Email Accounts tab. New in your customer profile! For even more convenience, you can manage your email accounts directly through the customer profile - Add and Manage Email Accounts under Hosting Account Details. In the Email Accounts menu you will find not only change in the organization and layout, but also a few new features. In cPanel version 54 a new feature for suspending certain email account options was released. In cPanel 70 the menu layout is updated and there is a new Hold option for outgoing messages. Upon activating the Hold option for a certain email account, the outgoing messages are queued from the mail server. When the email account tries to send a message, the inbox receives an email notification that the outgoing messages have been hold (Sender email@goodexample.eu has an outgoing mail hold). Upon deactivating the Hold option, the mails still queued from the mail server are sent within an hour. With the Manage Suspension option you can manage three actions of the mail account: 1 allow/suspend access to the email account (Log in), 2 allow/suspend incoming messages (Receive) and 3 allow/suspend/hold outgoing messages (Send). The Email Disk Usage tool in cPanel shows disk usage in folders for each email account, but it is also really useful for deleting emails. The tool is very handy when you need to free up disk space in your account by cleaning up old or unnecessary email messages. You can preview the number of messages in each folder of the email account and delete messages that match specific criteria - older than a year, larger than 30MB or others. 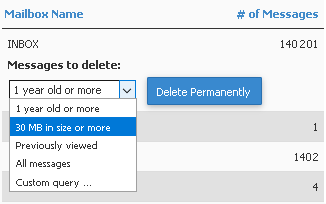 For a more precise filtering for mails to be deleted you may use the Custom query option to set up more specific keywords. The option is a bit more complex than the automatic available ones, but it is very flexible and precise. You can configure it so that it deletes all messages containing a specific BODY word, ones that have been sent FROM a certain email or containing a certain word in their SUBJECT. If a folder contains many messages from the same domain-sender with different email addresses such as email1@spamdomain.com, email2@spamdomain.com and so on, you can easily remove them with the keyword combination "FROM @spamdomain.com". Be careful with deletion options since once deleted messages cannot be recovered unless you have recent backup. Test the option by copying a few messages into a new folder and configure deletion options there. Spam filters are enabled by default on each hosting account as they can be managed from the Spam Filters menu in cPanel. In previous cPanel versions this menu was called SpamAssasin and its layout was very different. The settings and configuration of the spam filter are the same but ordered in a different way. 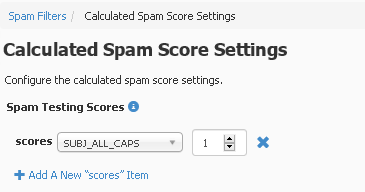 The new feature in this menu is the ability to tune Spam Score Settings. Until version 70 changes in score settings could be performed only manually by editing the configuration file of the Spam filter. The new feature now enables you to automatically select the given test and enter the score. If you are satisfied with the level of spam protection and your inbox does not get spammed anymore, we do not recommend changing the spam filter settings. When you need to increase the level of spam protection, you can change only one of the filter’s settings - the Spam score. The score set by default is 5, but to make the protection more restrictive you can lower it to 4 or 3. Read more on assigning spam scores and setting a custom threshold in the article Enabling SpamAssasin for your Email Accounts. Besides the main spam protection with the SuperPro and SuperHosting plans we offer even higher level of security with the Intelligent SPAM Filter. The Filter does not need any configuration or settings change since it can be taught how to filter spam as it gains experience from your actions. One of the easiest and fastest ways to check your email, especially in cases when you do not use your PC is through Webmail. By using the cPanel built-in webmail clients such as Horde, RoundCube and SquirrelMail you can send and receive email messages directly through the web browser without installing email software on the used device. You can access these webmail clients from certain URL in the browser. Each user may choose between one of the three clients after logging into webmail. The webmail home page has a few settings for the respective email accounts. The new in cPanel webmail are the two Spam Filters and Search Index settings. There is also news that SquirrelMail will be removed from the incoming cPanel versions. When the Spam Filter is activated through cPanel » Spam Filters and Spam Auto-Delete has not been activated through Webmail » Spam Filters, you can activate Spam Auto-Delete (through the option "Additional Configuration"). When Spam Auto-Delete has been activated from the global setting in cPanel » Spam Filters, you cannot deactivate it through Webmail » Spam Filters. You can only change the threshold at which Spam messages are deleted (through the option "Additional Configuration"). There is a Full-Text Search Indexing support for the mail server that has been added to cPanel version 64 which can improve mail search especially when it comes to mailboxes with a big volume of messages. There is a new Search Index menu which enables you to initiate reindexing incoming mail messages in a given email account. If you are checking your email through IMAP and cannot find a message when searching in the email client (iOS devices, Microsoft Outlook, SquirrelMail, Horde, Roundcube or Mozilla Thunderbird) reindexing your mailbox can solve the issue. 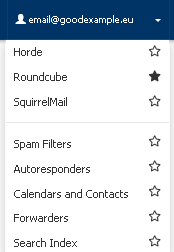 If you are working with the SquirrelMail webmail client, you might need to choose between the other two clients Horde or RoundCube. As of cPanel version 74, the support of the SquirrelMail webmail client will enter into a removal stage and in versions 76 and 78 the client will be completely removed and will be no longer available in cPanel. Until then you will have plenty of time to choose another client and get used to working with it. Horde and RoundCube are intuitive and user-friendly webmail clients. Since SquirrelMail was first added to cPanel more than ten years ago, its layout or features have not changed much. Its latest update dates back to May 2013. This webmail client may still be used after cPanel version 78 as it can be additionally installed through Softaculous » Mailboxes, but we do not recommend doing this. SquirrelMail has not yet been updated in terms of security for quite a while so it may expose to risk the security of your whole hosting account. For the time being it is still not sure even if Softaculous will completely remove this webmail client from its lists of applications. It is also not certain if cPanel developers will replace SquirrelMail with another webmail client. There are such ideas and one of those requests comes from the cPanel users of the open-source webmail client AfterLogic Webmail Lite. Version 62 of cPanel combined the two editors Simple Zone Editor and Advanced Zone Editor in a new menu DNS Zone Editor. cPanel 70 completely removes the two editors as only the new one DNS Zone Editor is available now. Creating the most popular DNS records is simplified since the buttons for creating a new А, CNAME and MX records are available on the editor's home page. Advanced settings for editing DNS records can be accessed through Management. The option to generate keys directly in cPanel » SSH Access » Manage SSH Keys is very useful for everyone who wishes to access and manage their hosting account through SSH. You can generate a special encrypted key for each new device that enables you to connect to your hosting account as this option allows you to verify this device when it connects to your hosting account via SSH. With the new menu you can not only generate keys, but also suspend them temporarily or remove them completely. Accessing the hosting account via SSH keys is considered highly secure. So we recommend using this way to access your hosting account. When you are using an SSH key you are not required to enter your hosting account password. Through the User Manager in cPanel you can generate new users, modify existing ones, change passwords and grant access rights for FTP, email accounts or others. The next cPanel versions will also offer interesting tools you can learn about if you visit our Blog often.